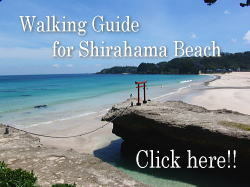 is only available to go to Izukyu-Shimoda station. "Odoriko Express" A direct train between Tokyo, Shimoda and southern area of Izu. This free pass has been cancelled on June 30th 2011. If you go to South area of Izu peninsule, we recommend you this useful pass. "Odoriko Minami Izu Free Kippu"
The regular fare of round trip from Tokyo to Shimoda by JR Odoriko is 12,920 yen. But if you use this Free Pass, it would be 11,400 yen. In addition, if you use the buses many times in southern area of Izu......... Oh! Great!! The reservation of the seat and ticket woud be acceptable 1 month before the departure date. 1) Around trip to the Izu Peninsula by JR Odoriko limited express. and Tokai buses in southern area of Izu. 3) The ticket is valid on three consecutive days. 5) It is not possible to get off at stations between departure station and the free area. 6) Seat reservations can be made for free. 7) Unlimited usage of local trains between Shimoda and Ito. Irozaki in Minami Izu-cho and Matsuzaki-cho in western area of Izu peninsula. 9) Points of sales are major JR stations, Green Couinter, and travel agencies. *Odoriko limited express depart from Tokyo, Shinjuku and Ikebukuro JR station.